The spectacular Brownshill Dolmen situated just outside Carlow. The ancient Brownshill Dolmen is an impressive example of a megalithic ‘portal tomb’. This ‘cromlech’ (from the Irish ‘crom’ meaning ‘curved and ‘leac’ meaning ‘slab’) dates from between 3300 to 3290 BC. It has a sizeable (4.7m x 6.1m x 2m) capstone formed from granite that rests atop two large portal stones, a prostate slab and a door stone. The entrance would once have been sealed shut with small stones, though these have largely eroded over the centuries. It is the largest capstone in all of Europe, and though no one can be certain, it is thought that it weighs in excess of one hundred tonnes. Beautiful County Carlow is famed worldwide for the Brownshill Dolmen. This portal tomb (or ‘Druid’s Altar’) is located at Browne’s Hill, which is roughly three kilometres east of Carlow town itself. 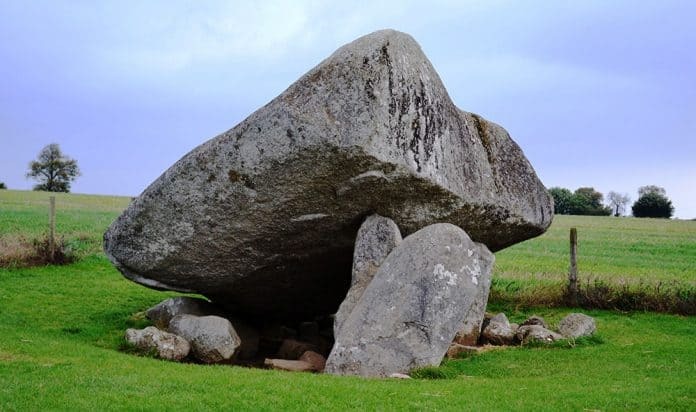 While this mysterious cromlech is almost certainly the county’s most notable feature, mystery surrounds how the inhabitants of ancient Ireland actually managed to position these huge stones. However, the very fact that they managed to do so does indicate that their time was not totally taken up with classic hunter-gatherer activities. That they went to such extremes and put in such huge levels of physical labour indicates how strongly they felt about honouring their dead. Of course, it was not the ‘ordinary’ dead that were revered here – it was only those of the very highest rank such as chiefs (and their kin) and even kings in some cases. Three theories have been put forward to explain how this ancient Dolmen was erected. The first theory is that rather than dragging the capstone into position, it actually already existed in situ. This theory contends that holes were dug to support the uprights and then the areas around the stone were excavated. The second theory posits that the uprights may have been positioned first, and then a ramp consisting of timber, earth and stones could have been used to lever the huge capstone on top. The third possibility is that the ancient workers could have in effect levered up one side of the capstone and, while it was raised, pushed in stones and earth, making it rise still further. If they had continued to do this round the stone’s circumference, the capstone would, over time, have been pushed up to the level of the supporting uprights. It could then have been carefully settled into its current position. Three views of the Brownshill Dolmen from various angles which highlight the enormous granite capstone. It is known that lots of contemporary dolmens in Ireland were originally covered with a generous scattering of earth. This means that it is highly likely that many similar tombs lie hidden in plain sight across the Emerald Isle, just waiting to be discovered. While we don’t know precisely how Ireland’s Stone Age people managed to place such heavy stones so accurately, we do know what motivated them, and that was the conviction that their high-ranking dead must be honoured. This was one of a number of ways in they did so. As well as Dolmens such as this, these ancient people also created artificial earthen mounds called ‘moates’. Inside such structures, burnt human remains contained in clay and also skeletons have been found. ‘Cairns’ are similar to moates, although they are constructed from stones rather than earth. ‘Kists’ are box-shaped graves with a roof, floor and sides made from flagstones and longstones (or ‘galluns). The gallums were often decorated with a decorative script (‘Ogham writing‘) dating from 3000-4000 BC. It is thought that these prehistoric graves may have been reused by subsequent generations. In more recent (comparatively) times, a portal tomb (cromlech) such as the Brownshill Dolmen may also have been referred to as a ‘Druid’s Altar’ or ‘Leaba Dhiarmuid agus Gráinne’, which translates as ‘the bed of Dermot and Grainne’. This refers to is the famous prose narrative that tells the story of the love triangle between the legendary warrior Fionn mac Cumhaill, the exquisitely beautiful princess Gráinne and her cuckolded husband Dhiarmuid. The Brownshill Dolmen is easy to find. Simply head east on the R726 (Hacketstown Road) for approximately two kilometres. The portal tomb (cromlech) is signposted just off the main road to the right with easy access and a dedicated parking area. The Dolmen is clearly visible from the main road.